On February 12, 2017 you collectively tallied 77 eagles through 48 volunteer hours invested (Table 1). The warm weather might be inducing birds to be moving back north towards their summer territories. Certainly, much activity is occurring around our local nests and it would not be surprising if local pairs began laying eggs in a week or so, assuming that the warming weather continues. The pair on the Grand Avenue nest are spending a great deal of time at the nest so far. In contrast, the Culvers pair is not spending a lot of time at either of their two nests. I have not seen the nest at Kransfelter’s Island or at Ferry Bluff further downstream. Of equal interest, Barb and I saw adult eagles in Ely, MN this past month. Ely is located along the Canadian border. The eagles were flying near a nesting territory so it is possible that local breeding birds did not even leave their breeding territory that far north. 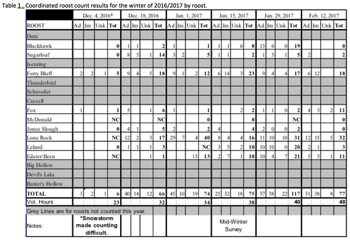 This could be one explanation for a low winter population in the Sauk Prairie area this year – not as many local birds were forced south this winter. Remember that our records suggest that the birds that winter in the Sauk Prairie area tend to nest in northern WI, the UP of Michigan and northeastern MN. Perhaps southern Ontario as well. These areas have all had a mild winter this year so it is possible that many eagles have not migrated very far south. Thus, the conditions that determine winter numbers in Sauk Prairie may be related not only to habitat conditions here but also to conditions found on breeding areas during winter. Why do eagles try to winter so close to their breeding territory? We don’t have that much direct data for eagles but other strongly territorial species like Sandhill Cranes, Common Goldeneyes and Common Mergansers have been better studied. In those species, it may be adaptive to winter as close to breeding areas as possible because resources on summer areas are severely limited compared to the population size using them. For goldeneyes and mergansers the limited resource is thought to be nesting cavities. For Sandhill Cranes the limited resource may be breeding wetlands that form a core part of each crane pairs breeding territory. In essence, if unoccupied cavities or wetlands cannot be found then a pair cannot breed that year. That is a powerful incentive in a world that answers to evolutionary forces. Of course, possession is 9/10th of the law so the first returning birds to claim a territory have the best chance of retaining that territory once other competitors arrive on the scene. Being the first return is guaranteed best by wintering as close as can safely be done so that a bird can quickly react to the spring thaw whenever it commences. The advantages of wintering further north are balanced against the risks taken by persisting safely in cold climates. Birds may differ on what choice they make and the selection can be very dynamic with birds shifting further south in cold snaps and shifting north in warm spells. We have documented this dynamic winter behavior in our telemetered eagles. This doesn’t mean that winter habitat conditions are unimportant. It only means that other factors may also play a role in determining how many eagles grace our Sauk Prairie area. 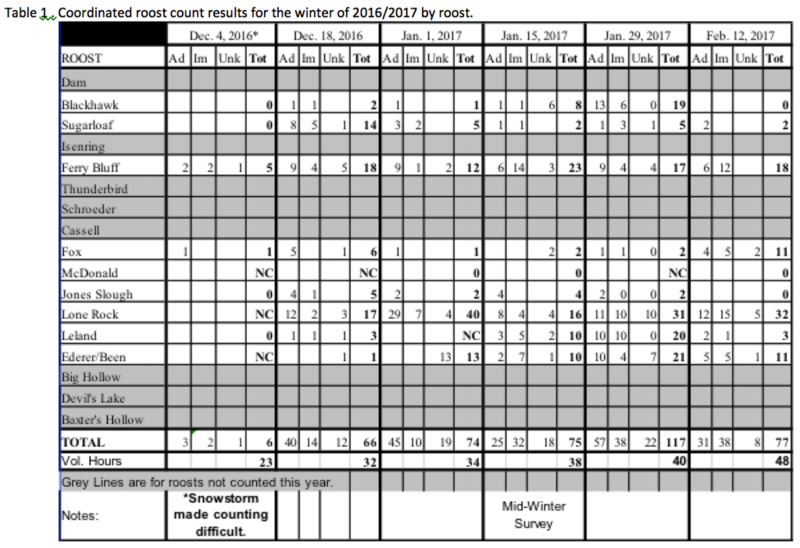 Perhaps this is such a year where mild conditions in breeding areas are as relevant as are conditions on winter areas. Some other questions have also been posed by counters that might be useful to address here. 1. Do mated pairs roost together? We really don’t know in part because so few eagle pairs have both members marked. It is likely that local pairs that do not migrate (if some pairs don’t migrate – something we also don’t have direct data on) may roost together but we don’t have direct evidence of this. It is also possible that migratory pairs split up in winter and only reunite once they return to their nesting area. With cranes, species that have been much easier to mark as social groups (i.e. families and pairs), we know that though some pairs winter together, other pairs winter in separate states. Both scenarios result, however, in crane pair members reuniting on breeding territories. In some cases, when a Sandhill Crane pair member arrives a few days later than it’s mate, it finds a new crane has taken his or her place. Strident completion usually results with the usurper often, but not always, being driven off. It is a more complicated world out there for long-lived, highly territorial cranes and I suspect the same is true with eagles if only we could observe these birds better. 2. Do eagles lead each other to roosts? Perhaps. Again, our data are sparse because not many birds have been marked. 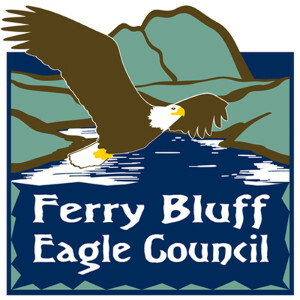 From FBEC telemetry projects we know that generally, eagles roost as near their foraging areas as possible. For this to occur there is no reason to follow other eagles. Yet we also know that many exceptions occur. 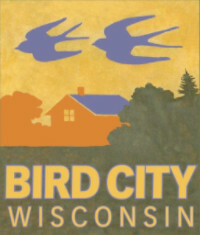 A telemetered eagle, for example, fed near the Lower Wisconsin River was tracked flying over Fox Roost, located within 3 miles from the bird’s foraging area that day. This eagle, however, did not roost at Fox. Instead, it flew onto the Ederer/Been Roost located another 10 miles north of the foraging area. What we don’t know, however, is whether the eagle followed another bird to this different roost or whether it was disturbed from Fox Roost, where it had roosted previously, and moved to a new roosting location. As with the above question, our lack of ability to study marked individuals makes answering simple but interesting questions, like this, possible.